Google Assistant is coming to Google Pixel and Google Home, the Amazon Echo-competitor. During a product demo of what was first demonstrated at Google I/O earlier this year, we were shown Google Assistant looking up movie listings as well as processing phrases like "is that any good?" to find reviews or a trailer – the point being that it uses conversational cues. Google wants to put Assistant in its wearables, Android in-car as well as in phones. Expect it in Google Chrome, too. It is already in Google's Allo messaging app (which is like WhatsApp). He demonstrated enhancements in machine translation, "closing the gap" with machine translation as well as in terms of enhancements image captioning, better understanding what images are showing. 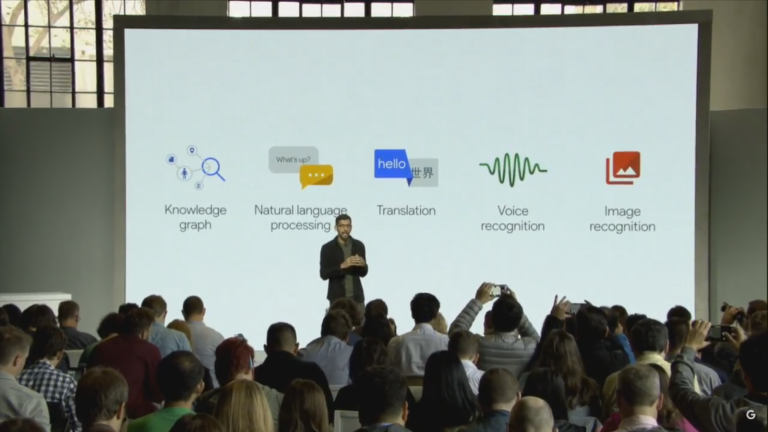 Pinchai also talked about how we're moving toward an "AI-first world...we're committed to this vision for a long time"
Google has also announced an open developer platform for Assistant, called Actions on Google, opening in early December for all.